Give it more style and function than ever with this convenient pack-and-go system. Insulated and non-insulated shoppers, plus two totes and a handy freezer pack, make outings to the supermarket and other stores quick, easy, and fun. Get organized. Both shoppers are detailed with elastic bands, plastic clips, toggle closures, and 11" handles so groceries stay secure in your cart or around your shoulder. Fill them with everything from chips and soda to paper towels and detergent. Use the two totes--featuring 11" handles and easy-to-pack flat bottoms--for produce, canned goods, and smaller items. Chill out or warm up. The insulated shopper offers a thermal lining and a zip top so perishables stay hotter or colder longer. Plus, it includes a special pocket for the Cool Gem freezer pack, making it great for dairy products, meats, and frozen foods. Get carried away. And just because they are great for shopping, why stop there? 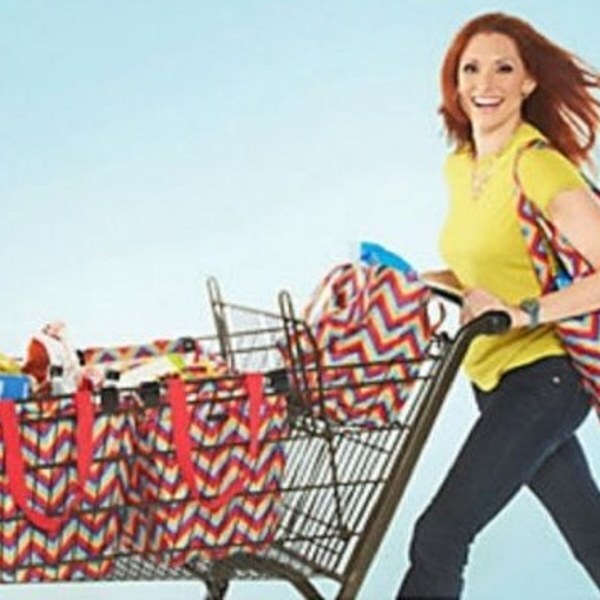 Use these handy bags for the beach, a party on the go, and so much more! Features: Shoppers: Elastic bands, four plastic cart clips, toggle closures, and 11" drop handles Insulated shopper: thermal lining, zip top, and freezer pack pocket Totes: 11" drop handles, flat bottoms Clean interiors with damp sponge, exteriors with damp cloth and mild dish soap Measurements: Shoppers 24"L x 12"W x 12"H, hold up to 40 lbs. ; Totes 13"H x 15"L x 5-1/2"W, hold up to 12 lbs.